Beijing, September 26, 2016 – China Alliance for Financial Inclusion (CAFI), co-founded by Renmin University of China, CreditEase, HSBC Bank, Minsheng Bank, Ant Finance and Visa, was officially open for business at the 2016 International Forum for China Financial Inclusion held on August 25-27 in Beijing. BEIJING, September 20, 2016 – From May when ToumiRA was launched to end of Au-gust, different portfolio strategies scored impressive return for investors, between 12.6% - 25.9% of annualized returns for different portfolios, according to the freshly published performance report. 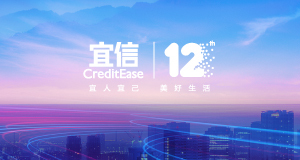 ToumiRA is a top ranked robo-advisory wealth management platform introduced by CreditEase, a leading FinTech Company in China and also the parent company of online consumer finance marketplace Yirendai (NYSE: YRD).